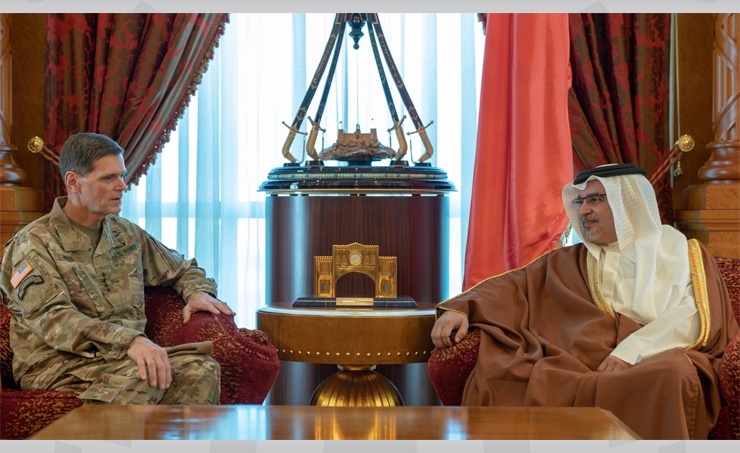 Manama, Feb. 12 (BNA): His Royal Highness Prince Salman bin Hamad Al Khalifa, Crown Prince, Deputy Supreme Commander and First Deputy Prime Minister, today met with the Commander of the United States Central Command (CENTCOM), General Joseph L. Votel, at Gudaibiya Palace. During the meeting, HRH the Crown Prince outlined the strength of relations between the Kingdom of Bahrain and the United States of America, which continue to grow across various fields, particularly in defence and military cooperation. HRH the Crown Prince also highlighted the importance of further advancing strategic bilateral collaboration in order to maintain regional security and stability. The Chief-of-Staff of the Bahrain Defence Force (BDF), His Excellency Lt-General Dhiyab bin Saqr Al-Nuaimi, also attended the meeting.